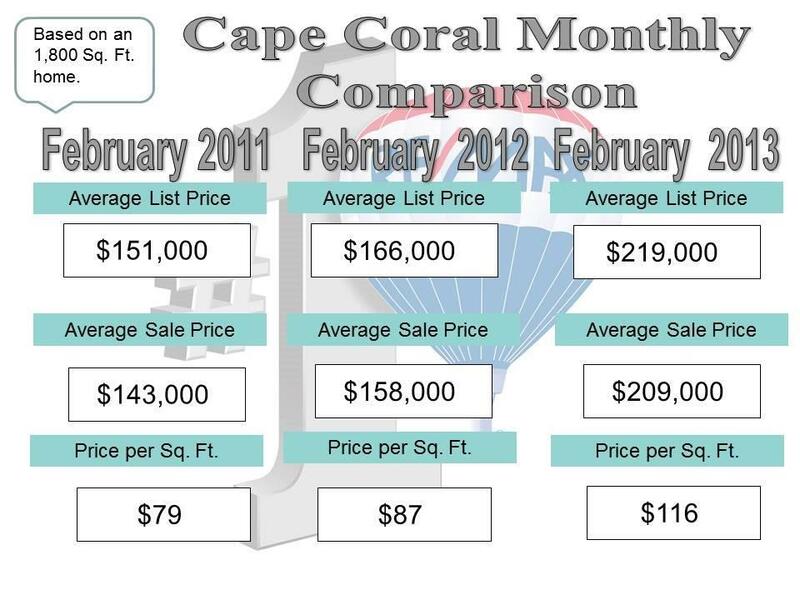 February's Cape Coral $209,000 median home price is a 32% increase from February 2012 (see chart below). This marks 32 straight months of year-over-year prices increases, and the first month the median price surpassed $200 K since June 2008. In our recent update about February's new $200 K benchmark we stated there was only one home sold for over $1 Million. A day later, a tardy posting in the MLS of a second home sale at exactly the same price ($1.9 Million) was reported. Impressive to have two home sales nipping at the $2 Million mark in one month. 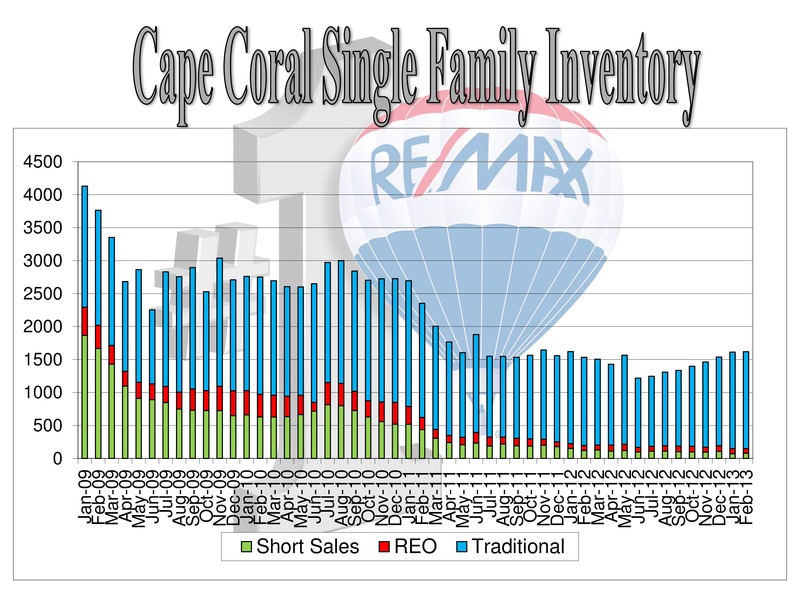 Tom: Above is a four year chart of Cape Coral home inventory, In January 2009 there were 4,300 homes for sale, about a three year supply. Currently there are approximately 1,600 homes for sale, a four month supply, a huge decrease and strongly leaning toward a seller's market for appropriately priced homes. Note the dramatic drop in short sales and foreclosures (REO) over the past four years. The shortage of inventory, combined with relatively few distressed homes sales, explains why Cape Coral and Ft Myers are experiencing such dramatic price increases, and should continue to do so for the foreseeable future. 1. Pent up demand due to lack of new construction since 2007. 2. Baby Boomers are retiring in record numbers, with many wanting warmth & water. 3. Shortage of Inventory: We have less than four months of active home inventory. 4. Lower home prices than any other waterfront community in Florida. 5. Record low interest rates, that are expected to remain low for at least another year. 6. Stock Portfolios: Most people's stock portfolios have seen substantial growth. 7. National Real Estate Recovery is underway, setting the stage for new Florida residents. 8. Strong influx of international buyers, from more and more countries each year. Short Sales vs. Foreclosures: Contrary to popular belief, foreclosures are now a better deal for buyers than are short sales. In 2012, South Florida foreclosure prices were 3.5% lower than short sale prices. It now makes even less sense to attempt to buy a short sale, wait 3 to 6 months to hopefully get approval from the bank, have a high risk that the bank will not approve, then to pay a higher price several months later for a foreclosure home, which we could have bought with certainty and a quick response from a bank. Late payment on U.S. mortgages hit a 4 year low in Feb according to Trans Union. Add Venezuelans to the growing list of foreign buyers interested in South Florida real estate. Venezuelans now account for 11% of foreign purchasers, behind only Canadians at 34%, and Brazilians at 14%. 1. Seawall/Dock/Lift Permits: The Cape Coral City Council and the Army Corps of Engineers approved a resolution that once again gives the city authority to approve seawall, docks and boat lift construction permits. This decreased potential waiting time on permits from 3 - 18 months, down to a few days. Elected officials and members of the construction and real estate industries all praised the collaboration. 2. $30 Million RV Park: On Monday the city council approved an upscale $30 Million dollar RV park on Burnt Store Rd, in the NW section of the Cape. The 188 acre - 250 site project, called Resort at Tranquility Lake, will be a luxury short-term park with an 87 acre lake, clubhouse & spa, mini-golf, several pools, and restaurants. To discourage smaller, less desirable RV parks, the council adopted several RV ordinance proposals, including a minimum of 75 acres and a maximum lodging time of six months. Tom: I've always been opposed to RV parks in the city, but this level RV park is a boost to the city, and will bring many new upscale visitors to Cape Coral. The restrictive ordinances for future RV parks are pro-active, quality of life measures to the benefit of the city's residents. 3. Impact Fees: Within the next 30 days Lee County and Cape Coral are both deciding whether to waive the impact fees on new construction. This waiver, which would be in effect for one or two years, would save builders/homeowners over $10,000 per home, and would spur on construction of new homes, create numerous new jobs, and generate significant tax revenues. 4. Chiquita Boat Lock: is in need of restoration/repairs. Politicians are contemplating whether to repair, expand or eliminate the lock altogether. Many boaters living in the southwest section of Cape Coral prefer eliminating the lock to decrease wait times, especially on the weekends during season. Client: "I want to own a home in Cape Coral but can't relocate for another few years. What is a good strategy to take advantage of today's prices before they go much higher?" Tom: Depending on your time frame, housing needs and financial resources, there are a few options. 1. Many clients who are retiring in a few years, but have watched prices steadily climb, decided to buy a home now and rent it seasonally until they can move here permanently, or for a good part of the year. I strongly suggest seasonal rentals over annuals rentals for numerous reasons, which I will gladly explain to any clients wanting further clarification. Several of our clients have purchased gulf-access homes, gotten the home in top condition, furnished it, then rented the home during high season to cover the majority or all ownership expenses. We suggested repairs/improvements, then referred them to one of two excellent seasonal management companies. These owners enjoy the home when it's not rented. 2. Another option for those who want to build a home when they relocate here is to buy a lot now while prices are still reasonable, and build whenever you are ready. Gulf access homes in particular are rising at a rapid rate, and the majority of that increase is the rising price of waterfront lots. Construction costs are also rising, but at a more moderate 6-10%, as opposed to gulf-access lots which are seeing 20 -25% appreciation over the last year. Buying a gulf-access lot provides the option of building on it later, or as a well-timed and maintenance-free investment. 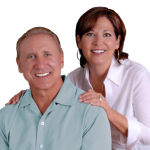 Our long-time clients know how important timing is in real estate, especially in Southwest Florida. We have a list of respected, reliable and quality builders that we can suggest upon request. Although new construction prices are set in stone (for financing and other reasons), we can often get a builder to throw in a few upgrades for our clients. Thank you once again for making me the top producing agent at RE/MAX for February, a follow-up to the award in January. 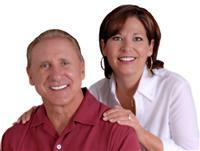 RE/MAX has over 100 top-notch agents, and is the largest realty agency in the area. It is a challenge to be top producer in any single month, very difficult to do it two months in a row. Sue and I appreciate your business and loyalty. Topics: Local Home Prices Up 32% - Is It Too Late to Enter the Cape Coral / Ft. Myers Market?